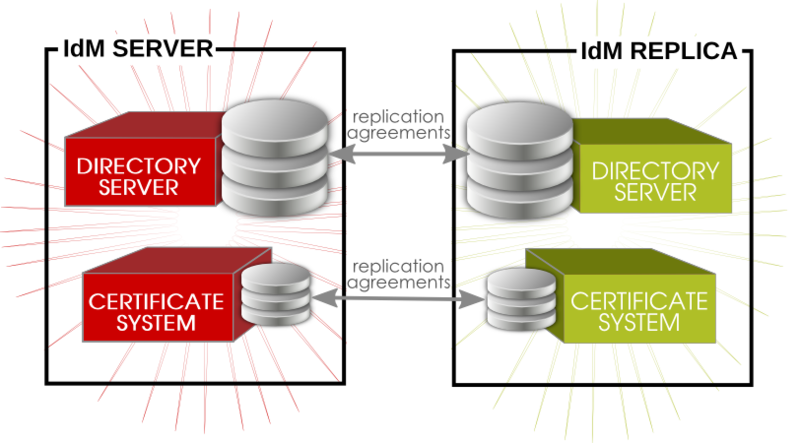 Information is shared between the IdM servers and replicas using multi-master replication. What this means is that servers and replicas all receive updates and, therefore, are data masters. The domain information is copied between the servers and replicas using replication. As replicas are added to the domain, mutual replication agreements are automatically created between the replica and the server it is based on. Additional replication agreements can be created between other replicas and servers or the configuration of the replication agreement can be changed using the ipa-replica-manage command. When a replica is created, the replica install script creates two replication agreements: one going from the master server to the replica and one going from the replica to the master server. As more replicas and servers are added to the domain, there can be replicas and servers that have replication agreements to other servers and replicas but not between each other. For example, the first IdM server is Server A. Then, the admin creates Replica B, and the install script creates a Server A => Replica B replication agreement and a Replica B => Server A replication agreement. Next, the admin creates Replica C based on Server A. The install script creates a Server A => Replica C replication agreement and a Replica C => Server A replication agreement. Replica B and Replica C both have replication agreements with Server A — but they do not have agreements with each other. For data availability, consistency, failover tolerance, and performance, it can be beneficial to create a pair of replication agreements between Replica B and Replica C, even though their data will eventually be replicated over to each other through replication with Server A. After getting the server/replica list, then it is possible to list the replication agreements for the server. These are the other servers/replicas to which the specified server sends updates. Replication agreements are created by connecting one server to another server. If only one server is given, the replication agreements are created between the local host and the specified server. Replication between servers and replicas occurs on a schedule. Although replication is frequent, there can be times when it is necessary to initiate the replication operation manually. For example, if a server is being taken offline for maintenance, it is necessary to flush all of the queued replication changes out of its changelog before taking it down. To initiate a replication update manually, use the force-sync command. The server which receives the update is the local server; the server which sends the updates is specified in the --from option. When a replica is first created, the database of the master server is copied, completely, over to the replica database. This process is called initialization. If a server/replica is offline for a long period of time or there is some kind of corruption in its database, then the server can be re-initialized, with a fresh and updated set of data. Changes — both for IdM domain data and for certificate and key data — are replicated between IdM servers and replicas (and, in similar paths, between IdM and Active Directory servers). Even though replication operations are run continuously, there is a chance that changes can be made on one IdM server at the same time different changes are made to the same entry on a different IdM server. When replication begins to process those entries, the changes collide — this is a replication conflict. Every single directory modify operation is assigned a server-specific change state number (CSN) to track how those modifications are propagated during replication. The CSN also contains a modify timestamp. When there is a replication conflict, the timestamp is checked and the last change wins. Simply accepting the most recent change is effective for resolving conflicts with attribute values. That method is too blunt for some types of operations, however, which affect the directory tree. Some operations, like modrdn, DN changes, or adding or removing parent and child entries, require administrator review before the conflict is resolved. Replication conflicts are resolved by editing the entries directory in the LDAP database. Those entries can be searched for and displayed in the IdM CLI, but they cannot be edited or deleted until the conflict is resolved and the DN is updated. The unique identifier attribute nsuniqueid cannot be deleted. Setting the value of the deleteoldrdn attribute to 1 deletes the temporary attribute-value pair cn=TempValue. To keep this attribute, set the value of the deleteoldrdn attribute to 0. When a delete operation is replicated and the consumer server finds that the entry to be deleted has child entries, the conflict resolution procedure creates a glue entry to avoid having orphaned entries in the directory. In the same way, when an add operation is replicated and the consumer server cannot find the parent entry, the conflict resolution procedure creates a glue entry representing the parent so that the new entry is not an orphan entry. If the conflict resolution procedure finds a deleted entry with a matching unique identifier, the glue entry is a resurrection of that entry, with the addition of the glue object class and the nsds5ReplConflict attribute. In such cases, either modify the glue entry to remove the glue object class and the nsds5ReplConflict attribute to keep the entry as a normal entry or delete the glue entry and its child entries. The server creates a minimalistic entry with the glue and extensibleObject object classes. In such cases, modify the entry to turn it into a meaningful entry or delete it and all of its child entries.